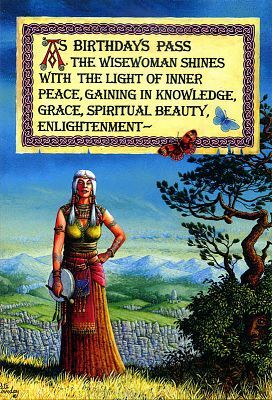 - Front of card reads: As birthdays pass, the wisewoman shines with the light of inner peace, gaining in knowledge, grace, spiritual beauty, enlightenment--... and continues on the inside: ... and cellulite. Have an Enlightening Birthday! Artwork by Pete Loveday. Tree friendly, printed with vegetable oil based ink. Card measures 8" by 5 1/2". Do you have any other questions about our Enlightening Birthday Card?